Thermodynamic Solar Panels are perfect for Ireland for one simple reason. A single thermodynamic solar panel application can offer a family of 6 people 100% of it’s hot water every single day of the year. 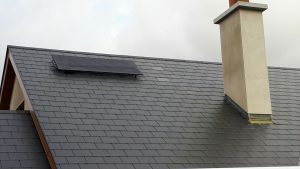 Normally located on the roof (but can also be wall mounted), the thermodynamic solar panel uses all Irish weather conditions to vaporise a very cold inert refrigerant gas that flows through the panel. Once the gas in the Thermodynamic Solar Panel vaporises, it passes down to a very small compressor located near your water cylinder. The gas will vaporise and create heat which then transfers to your hot water via a heat exchanger. What this means, is that come hail, rain, wind, or shine, you can produce 100% of your hot water from one small panel. Cheaper Overall Running Costs than other systems. A lot has been said about thermodynamic solar panels over the years. A lot of this has been good, and some has been bad. Like any technology, there are good brands, bad brands, cheap and expensive products. Below are some of the facts laid bare. The Energie Thermodynamic Solar Panel contains a Solar Keymark which qualifies it as a solar panel. It does however utilise heat-pump technology also. The reality is that in a country like Ireland, where we cannot guaranty sunshine, this product offers lower overall running costs than other solar products with better guaranteed performance. What you are guaranteed is hot water all year round. You are also guaranteed to have a better performing system if the sun is shining. Are Thermodynamic Solar Panels new? LVP Renewables Ltd brought Thermodynamic Solar Panels to Ireland in 2007. We have tried and tested the systems in our own family homes over the years. In late 2017, we exceeded 3000 installations, with an ever growing order book. Energie have been manufacturing this technology for almost 30 years, continually improving the product. There are some other brands out there. LVP have installed most of them on a trial basis. We have had to remove some of these competitor’s technologies for major product failings. Whilst there may be cheaper options, nothing compares to the original and best. It is also important to note that these systems must be installed by a properly qualified engineer or problems can arise.